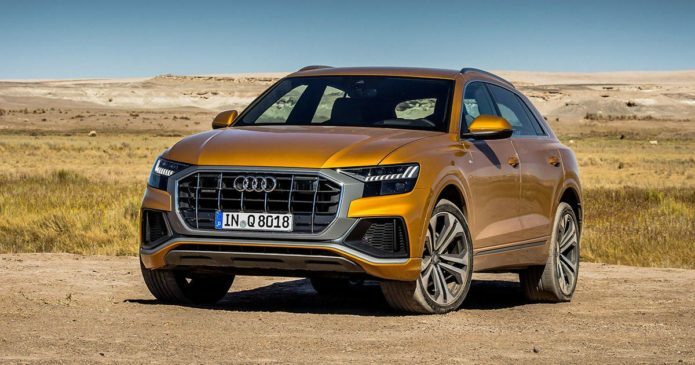 Audi wants a taste of the luxury SUV market that stablemates Porsche, Bentley, and Lamborghini have been enjoying, and the 2019 Q8 is how it plans to get it. Promising to combine cabin accommodations that rival a Cayenne, with levels of technology that could make a Bentayga blush, the Q8 also shoulders the responsibility of ushering in a dramatic new age of Q-series styling. Bolder styling, shorter overhangs, and a wider, slightly lower stance single the Q8 out as Audi’s more aggressive, purposeful take on the SUV. If the Q7 is top tier family transportation, the Q8 would like to oust the Range Rover Sport from your garage instead. In the process it’ll take on the the BMW X6 and Mercedes-Benz GLE Coupe. Even if you’re not in the market for a high-end SUV, the Q8 will have an impact on future crossovers and SUVs at more affordable price points in Audi’s line-up. The bold new design language will gradually trickle down through the range, the automaker has promised, including the new and more three-dimensional grille, and the dramatic rear lighting. Audi’s latest cabins are masterpieces of technology blended with quality trim, and the Q8 doesn’t stint on either. It borrows the same dual-touchscreen infotainment system as in the A8, putting a larger display at the top for navigation and multimedia, while a second, smaller display underneath handles HVAC, comfort features, and text entry. The broad gear shifter is designed to act as a wrist-rest as you tap and scroll, and the driver instrumentation is all presented digitally using Audi’s Virtual Cockpit system. It’s a comprehensive upgrade from what rivals are offering, certainly. Fully connected, the Q8 can display traffic light timing changes in select cities, translate your handwriting into addresses, pull down personalization settings from the cloud, and recognize natural language speech instructions. All surrounded by high-end wood, metal, and leather trim, with plenty of options on the order form to choose different hides and patterns. The 2019 Q8 may be based on the same platform as the Q7, but Audi uses that space differently. Most notably, the luxury SUV does away with the third row of seats. Instead it puts its cabin to use with ample space for five and all their combined luggage. It’s probably a wise decision overall: the more arching roofline would cut into third row headroom, after all. The Q8’s focus is really more on transporting people in luxury, and making sure it has space for their monogrammed bags. Figure on a healthy 21.4 cubic feet of space, in fact, rising to 62 cu-ft with the rear seats folded flat. Electrification may be spreading through Audi’s line-up, but not every hybrid is created equal. The 3.0-liter V6 TFSI engine that the US Q8 will launch with has the same mild-hybrid technology as we saw on the 2019 Audi A8. In short, think electric convenience, rather than zero emissions. It uses a 48 volt system, with an electric starter motor generator, and a li-ion battery. That gives an extra chunk of thrust to get you off the line more rapidly, as well as expanding how the stop/start system can run. European Q8 models, for instance, will be able to cruise at highway speeds with the gas engine completely shut down. Also in Europe will be diesel Q8 options. They’re not likely to make it to North American shores, mind. At this point, Audi hasn’t said whether the Q8 will follow the Q7’s example and adopt the 2.0-liter TFSI gas engine at some point in the future. That would certainly be more economical, but might not fit the Q8’s luxury positioning. The four-door coupe space is an odd category. On the one hand, it’s easy to dismiss such cars as merely borrowing the elevated driving position of true off-roadsers, but delivering little more in the way of practicality than a traditional sedan. Audi, however, hasn’t fallen into that trap. Instead, the 2019 Q8 has some legitimate off-road talents. This isn’t going to be the vehicle to replace your Discovery with for field-plugging, but permanent quattro all-wheel drive standard rear adaptive air suspension, and adjustable handling all mean mud shouldn’t be an insurmountable hurdle. There’s also tech like Trailer Assist on the options list. Audi is also offering some advanced drivetrain systems. You can have active rear suspension, for example: the rear wheels can turn, either in the opposite direction to those at the front at low speeds in order to tighten up the Q8’s turning circle, or in tandem with the front axle for greater stability at higher speeds. There’s speed-sensitive power steering, too. Audi has been working on driverless car technology for years now, though so far it’s yet to launch a system commercially. Instead, that research has been put to work helping with driver-assistance, and the Q8 is no different. In fact many of the sensors integrated into the Q8’s bodywork and grille are just what you’d find on a self-driving vehicle. That includes radar, ultrasound, cameras, and laser scanners, collectively covering 360-degrees around the car. They’ll help avoid collisions as you nose out of blind junctions, hit the brakes if you’re at risk of striking a pedestrian, and offset the danger of side impacts. In Europe, the Q8 will offer Audi Tour Assist, too: an adaptive cruise and assistance system that will work much like Tesla’s Autopilot on the highway. Okay, we’re getting ahead of ourselves: the 2019 Q8 won’t show up in US dealerships until later this year, after all. Still, the idea of an even more potent version of the four-door coupe has us salivating. All signs point to a 2019 Audi Q8 RS to satisfy those urges. If the rumor mill is to be believed, it’ll borrow the hybrid V8 system from Porsche’s Panamera Turbo S E-Hybrid. That means in the region of 670 horsepower and 627 lb-ft of torque. Enough, therefore, to make the Q8 RS the most powerful production Audi in the history books. Figure on styling changes too, along with a reworked suspension system and more sporting trim. Perhaps the Lamborghini Urus should start getting worried. The Q8 isn’t Audi’s only unusual SUV expansion this year. Going on sale by the end of 2018 – in some markets, anyway – will be the Audi e-tron quattro. That’s an all-electric crossover, which will take on the Tesla Model X and Jaguar’s I-PACE. Where the Q8 wants to convince drivers that luxury and SUVs aren’t unwelcome bedfellows, the e-tron makes a similar argument for SUVs and electrification. Might we one day see a Q8 EV? It’s too soon to say for sure, but one thing is clear: Audi is putting big bets on technology, luxury, and electrification, and the e-tron and Q8 are just the start of it.